Joe tells Max and Bree about Lyn. The Timmins boys are sentenced. The post mortem of the court case continues as Sky and Janae argue between themselves with Boyd trying to remain neutral over what the boys did and what the future holds now for them. Lyn comes through from the bedrooms to ask them to keep the noise down, as Janelle is very upset before heading through to the kitchen where Joe and Ozzie are amusing themselves. Joe tells Lyn that he is going to go home but Lyn asks him to stay because of what has happened (the court case) and what is to come (the funeral). Karl patiently waits for his date as Susan comes in for a bottle of wine. Max goes to get her one and they (Steph joins them as she is clearing tables) and they talk about the court case before Susan leaves, but not before wishing Karl well for his date. 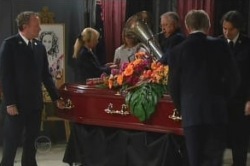 Harold pops in to see how things are going but Lou wants to send him home to continue his speech for the eulogy. Lou eventually relents as Susan comes by to ask who is going to say something about Lil since Svetlanka can't make it. Harold says it would be lovely if she could say a few words. Joe and Lyn arrive to invite Lou and Harold round for food but they knock back the offer as they've got things to do, so Lyn tells them that they'll pitch in, then they can go to No. 26 for some food. Sky takes a call from Kim to say he's taken Bree out for some food and Janae has a go at her - first for answering the phone and then because she is still hanging around given she couldn't give two monkeys about Dylan last week. Sky decides to leave and Boyd goes after her, which causes Janae to get upset. Many hands obviously make light work as everyone pitches in. Joe makes a quip that Lou sounds worse than David and thinks he's said the wrong thing but Harold smiles and confirms what Joe has said and the rest join in and reminisce the things that David was a stickler for and they get round to talking about Lil too. Susan comments that life is going to be quiet without them around. Karl is panicking because his date hasn't yet turned up and Max tries to calm his nerves by suggesting that she's probably just caught up in the traffic, which amuses Karl since the traffic is never bad. A lady walks into the bar and asks Steph if she's seen a single, dark, handsome guy who is hopefully not a serial killer around and Steph points her in the direction of Karl! At the bar, Karl has spotted Jenny and tells Max that she looks amazing and better than the photo of her on the Internet. Jenny approaches the bar and apologises for being late - she was caught in traffic! Karl introduces himself and leans in for a kiss but Jenny holds out her hand instead, and they shake hands. Both are nervous and they head to a table to order some food. A rough looking Connor opens up a newspaper cutting that has a picture of himself and Serena in it. Sky cries silently looks at the pictures of David, Lil and Serena that will be used for the memorial service when Boyd comes in and apologises for the things Janae said. 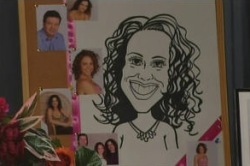 He tells her that a caricature she drew of Serena is good before Boyd asks if she's heard about her Uni interview. Sky is despondent but Boyd tells her off in a nice way and gets her to promise that she won't waste the talent that she has. Sky promises not to and they have a hug. Karl's date with Jenny seems to be going well and Steph comments to Max that this could be the one for him and she is happy for him having a change in fortune. Max looks at her funny and Steph confesses that she wishes the baby would hurry up and arrive because she is turning into such a girl! At the table, Karl and Jenny chat about her work as a government advisor, and he thinks she and the government are going a great job. Jenny asks if his ex shared the same beliefs and he replies no before complimenting her on the clothes she is wearing. Janae answers the door to Boyd and slams the door shut on him after telling him that she knows what is going on. Charming! Boyd decides to let himself in wanting to know what Janae is going on about. She tells him that he obviously wants to get back together with Sky especially after he went after her earlier. Boyd says that Sky was upset and grieving but that isn't washing with Janae, she tells him that Sky should have gone to other friends in that case. Boyd points out that Dylan and Stinger are inside and Serena is gone and therefore the only person Sky could turn to was him and he won't bail on her when she needs support. “But it's okay to bail on me,” replies Janae and Boyd tells her to grow up before leaving. 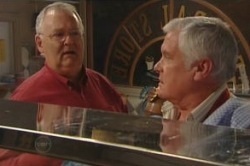 Karl decides to keep is scrooge reputation quiet from Jenny as he wants to pay the bill. Jenny is a bit put out initially but accepts his offer, as long as she pays the next time. “So there will be a next time,” asks Karl and Jenny replies that she hopes so. Max and Steph are watching the proceedings through the office blinds and Steph bets Max $20 that there will be a kiss before the night is out but Max doesn't think so because Karl is a bag of nerves. Karl comes up to the bar and pays the bill and thanks Jenny for a lovely night as they head out and at the door, he gives Jenny a kiss on the cheek. At the bar, Steph demands her money from Max even though he wants to put the money towards paint for the bedroom. SUSAN: Lil had a spectacularly short fuse, which was matched only by her sense of humour but I think it was her passionate love affair with life that made her such, such a wonderful friend,. That and her cooking but always to Lil the most important thing was family. I hope they're together now and I hope they remain in peace forever. SKY: When my cousin first came to live with Granddad and me I couldn't stand her. I thought who was this stuck up princess and how could we possibly come from the same gene pool? But she is so, so much more than my cousin, she's my sister and my best friend. I love you Serena and I now have a little note from our good friend Stingray Timmins who couldn't be here today. A teary Sky sits down and Harold now says his bit about David. HAROLD: In recent months, David and I have never been closer, for some reason we seem to understand each other for the first time. Oh what a wonderful man he's turned out to be. I couldn't be prouder or grateful for the gift, the life gifts that he's given me and in return the two wonderful women he's brought into my life - Liljana and my dear little granddaughter, Serena. You know what, at the end of the day our lives are measured by the people that we love and without that love our lives would be very empty, we'd only be existing. Buy as I look out over this room, I can see that David and Liljana and Serena were loved by many and I do thank you for loving them as much as I did. Thank you. Time to get more hankies during the commercial break. 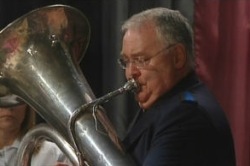 Harold plays a tune on his tuba as David's coffin is taken away. Harold thanks Lindsay for saying what he did. Joe tells Sky that she a ledged today for standing up in front of everyone and saying what she did remembering what he was like at Kerry's funeral before adding that Serena would be proud of her too. Sky thanks her dad and Joe notices Janae approaching, so he moves away. Janae apologises to her for being horrible and what she said and Sky accepts this as they hug each other. Lindsay tells Harold that they'll head to the cemetery in five minutes and Lou announces that the burial is private but everyone is invited to TSB for the wake later on. Sky and Harold head off together, each giving the other their support to get through it. The day is getting to Lyn and she wonders how much time any of them have. Joe says he's been thinking of things too - about how much he wants to be with her for the long haul. JOE: You are right Lyn Scully; life is too precious not to be with the ones you love. (Gets down on one knee) Lyn, will you marry me? LYN: Oh Joe of course I will. They have a kiss and a hug to celebrate the occasion. Karl tells Susan about his date with Jenny and that they have many things in common too, like music. Susan asks if he played her ‘Free as a river'! Joe and Lyn arrive and tell Harold about them getting married but given the day, they'll keep the news quiet. Harold disagrees though, as Lil and David would be delighted, so gives Joe his blessing to announce it to everyone. JOE: To honour the memory of David and Lil's everlasting love, I'd like to make an announcement. Lyn and I are going to get married; she's going to be my wife. Everyone starts clapping but Sky has a face like thunder on her. Karl and Lou offer Joe their congratulations, and Susan tells Lyn that they could have a double wedding! Lyn eventually clicks that Susan is pulling her leg as she invites everyone to No. 28 for a celebration as Steph gives her congratulations to her mum. Harold decides to make a speech. HAROLD: I just want to thank you for your support today and all the days prior to that. It's been a very sad few weeks and I can only imagine how much worse it would be without your continued love and support. And even in these dark times I realise how blessed I am to have such loving friends. So, thank you, thank all of you. Thank you.